For the past eight months, over 1000 students from eleven universities have worked to transform their visions to improve society into high-impact social ventures. On April 25th, six teams with the most creative and promising innovations from this year’s Rudd Family Foundation Big Ideas Contest are set to take the stage at the 7th annual Grand Prize Pitch Day. A panel of esteemed judges representing the Rockefeller Foundation, US Agency for International Development (USAID), Autodesk Foundation, and VentureWell, will be on hand to award $5000 in seed funding. The campus community is warmly invited to attend (RSVP above)! The teams selected for Pitch Day (listed below) represent the impressive diversity of ideas submitted to the Contest this year. Over 300 teams proposed innovations, representing more than 1000 students, 85 different majors, and 11 Universities (including all 10 University of California campuses as well as Makerere University in Uganda). 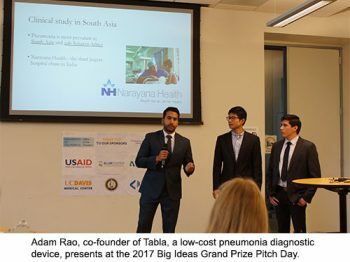 Teams proposed ideas aimed at tackling some of the world’s most pressing challenges – streamlining the refugee resettlement process, developing a medical diagnostic to help patients manage pain, and creating a service to address food insecurity on college campuses – just to name a few. Acarí: Transforming the hated and feared “devil fish”, invasive to Mexico, into tasty, nutritious, products to increase employment in rural fishing communities. Hiven: A community marketplace for micro-renting home workspaces, providing convenient and affordable workplaces for guests, and revenue for hosts. Innovis Medical: A blood monitoring technology enabling rapid point-of-care treatment for military and civilian trauma care. Loo Lab: A smart technology streamlining operations between pit latrine disposal companies and underserved communities to increase services and reduce costs in Rwanda. LUMENDA: An affordable and portable device for rapidly and accurately diagnosing neonatal bacterial meningitis in low resource settings. VIDI: A smart system leveraging computer vision to track surgical tools, reducing costs while increasing hospital efficiency and minimizing medical errors. On April 25th, these teams hope to follow other remarkable Big Ideas alumni whose innovations are improving the lives of countless individuals and communities across the world, such as: Copia, a food redistribution platform that last year recovered 950K tons of food to feed over two million people; We Care Solar, which has provided critical lighting and medical devices to nearly 3000 hospitals in low resource areas; and Dost Education, (2016 Grand Prize winner) a mobile technology that empowers parents of any literacy level to engage in their child’s education, reaching 10,000 families in its first full year and aiming to reach 1 million homes by 2020. Among the students competing in this year’s Grand Prize Pitch Day is Federico Alvarez Del Blanco. Federico and his team have leveraged their multidisciplinary backgrounds and expertise in medical technology, computer vision, and business to create their social venture called VIDI. Their big idea is to eliminate human error by automatically tracking surgical instruments with machine vision, similar to the technology used by self-driving cars. Federico says, “After a year of hard work, we can’t wait to share our big idea at Pitch Day. The mentorship, support, and connections we have received have helped our startup get real traction and were exactly what we needed to advance the development of our vision and prototype”. Grand Prize Pitch Day, is open to the campus community and the public, Wednesday, April 25th, 5:00 – 8:00 pm Pacific Time, at UC Berkeley’s B100 Blum Hall Plaza Level (RSVP required). At this exciting event, contestants will deliver four-minute pitches followed by a question and answer session with the judges. While the judges deliberate, attendees network with students and prominent leaders from many Bay Area industries. Audience members will also learn about all the ideas in this year’s contest and vote for their favorites through the “Big Vote” feature of the event. Food and drinks will be served during the evening, and the Grand Prize winners will be announced at 7:30 pm. On May 2, the following Wednesday, Big Ideas will be holding its annual Awards Celebration (also open to the public, RSVP required) from 5:00 – 8:00 pm in B100 Blum Hall. This event brings together all winners from this year, as well as the Big Ideas community to celebrate the conclusion of the 2017-2018 contest. The Rudd Family Foundation Big Ideas Contest provides students with support and mentorship for developing their social ventures. Since its launch in 2006, Big Ideas has received over 1,800 proposals, supported more than 5,000 students from multiple universities, and provided seed funding for participants that have gone on to secure over $460 million in additional funding. The Big Ideas contest is made possible through the generous support of the Rudd Family Foundation, as well as category sponsors including Autodesk Foundation, USAID, the UC Office of the President, Center for Information Technology in the Interest of Society (CITRIS), Associated Students of the University of California (ASUC), and the Blum Center for Developing Economies.